'Native Meets...' gives us the opportunity to talk about life and barbering with some of the most exciting and cutting edge barbers. We chat to Myke Greaves from King Kobys Chop Shop, a very unique barbershop situated within the historic Corn Exchange in Leeds City Centre, West Yorkshire, UK. Myke has been a barber for over 8 years, he is currently 1 of 8 barbers at King Kobys which has been established for over 5 years. King Kobys has a very unique feel and ethos can you tell us a bit more about it? We decided very early on that we were not interested in creating something 'cool' for cools sake. We wanted to exist with purpose, a purpose that extended way past profit making. We wanted to use our audience to spread a message. King Koby is a genuine family. We work together, socialise together, laugh together and cry together. When we do well we all share in it. When we do bad we all share in it. We call ourselves a brotherhood and we genuinely are, I think that is why we have been so successful. We are authentic and driven by a set of principles and values that have long since been abandoned by an industry that has lost its identity chasing the futility of 'cool'. I got into barbering by accident to be honest. I became a women's hairdresser pretty much straight from school, then one day I applied at a barbershop thinking it was a women's salon...the owner called me and asked if I still wanted to go for the job even though it was barbering, I obviously said yes and never looked back. Quite a few to be honest but my main is to progress further in my barbering career. No matter what, you never stop learning in barbering, which is why I love my job so much, it's never 'the same'. Also, King Koby has a lot of big things happening in 2016! I don't want to let anything slip but keep your eyes peeled! Yeah actually, and I still get sh*t about it from the lads now haha, I got asked to cut the guys from McBusted's hair when they played Leeds arena last year. Really nice lads, they chucked me, my Mrs and her younger sister tickets to the show, it was pretty good to be fair, they definitely know what they're doing. We also get a few of the Leeds United players through the door on the regular. 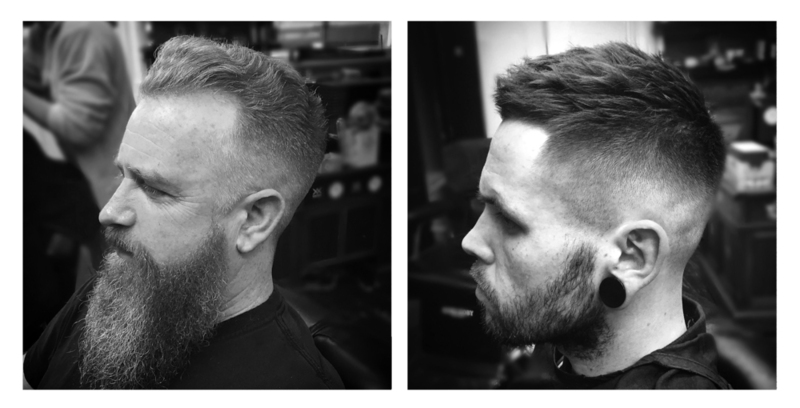 Probably the biggest of 2015 was the side parting with a beard (The 'Ricki Hall') but with having such a variety of clients, there isn't really ONE main style, which is good, it keeps us on our toes! 1. Very low taper (0-3) on the sides and nape of the neck.. Cropped short on top with a blunted fringe just below the hairline.. Styled w/ a matte clay and ruffled for texture. 2. Clipper over comb on the back and sides tapered to around a 1, I find it easier to create the wedge with the comb rather than a guard.. Blunt cut on top with a curved hard part.. Dried with medium heat and styled w/ a pomade to give a slick and shiny look. 3. Quite a heavy 1 fade, keeping it square with the head.. Hard part to keep it looking sharp. Point cut on top and styled with more of a matte finish product to keep a bit of texture. 4. Medium skin fade with a nice simple point cut on top with small quiff.. Styled w/ a matte product again to keep texture. Skin fade with a short crop & blunt fringe! Also my favourite! Great question! Erm, us Brits are definitely up there with the best, leaders I'd say, because we have so many different cultures, there's so many different hair types, you can't just get used to one. It's class that we can utilise every one of our tools (clippers, scissors, cut throat etc).. The Americans are close by and have the fades down but ask them to scissor/layer/texturise the top and a lot of them will be stuck. 5. Small wavey pomp with a medium skin fade and beard shape.. Dried with medium heat, to not straighten out the waves and kept dry (no product). I really enjoyed this cut (no.6 / above right), a high skin fade, fringe taken back to the hairline but left heavy and textured on top.. Styling is really simple, blow dried forward using a matte product and scrunched with the hands to really bring out the texture. All the Rocky's, Hook & Robin Hood Prince of Thieves. Got to be LEEDS! Barcelona comes close though. Love a good tikka masala. King Koby, Dickies, Vans, Carhartt. See more of the world and meet more people in and around the industry I'm so passionate about. La finca, Spain / Berlin, Germany. Such a cool city. My main inspiration would be my other half, her work ethic is unreal and if it wasn't for her Iprobably wouldn't be where I am today, she keeps my head screwed on (or tries at least).. My mother's also a big one, she's taught me everything I know. And of course the boys in the shop, them idiots are my second family!! I don't really have a style, i wear what I feel's comfortable..
A wide variety...from Billy Joel to Guns n Roses to Enter shikari to dre, ludacris, the game and gotta mention my homie & work colleague Sandy Minto (definitely check out his stuff! progressive hip hop).. It all depends on what mood I'm in at the time really.. I like music that creates emotion, whether it be anger, sadness or happiness, if it creates a feeling it's good..